It’s a battery; it’s a flash drive! Actually, it’s the Cell Drive! Offering the best functions of batteries and USB drives have to offer make this hybrid device super convenient. What’s more is that it streamlines our charging, syncing, and data transferring needs. As a result, the one-size-fits-all gadgets work with cell phones, GPS devices, Bluetooth, smartphones, tablets and pretty much any other USB device under the sun! Basically, the Cell Drive acts as a USB charger or cell phone charger for those inconvenient times when the proper outlet just isn’t available. It has both Mini USB adapters, regular adapters and an attachment for Apple products. It can really be a much needed salvation for a variety of users, particularly business men and women in the middle of an important phone call. Travelers and students could also find Cell Drive to be a really advantageous product to have when they’re away from their typical power and port sources. The USB Cell Drive is really useful in other ways as well. It doesn’t just work as a backup battery, although many would say that this feature alone makes it a worthy product. It also works as a data cable for easy transferring and syncing—emails and calendars correspond no matter where you are with the most up-to-date data. When it comes to the Cell flash drive component, the device is featured in 4GB or 8GB if a little more memory is needed. Either way, both capacities offer more than enough storage for heavy duty course loads, work documents, multimedia and PDFs. Many will find that the larger memory is quite economical at $60 as compared to $50 for the smaller size. 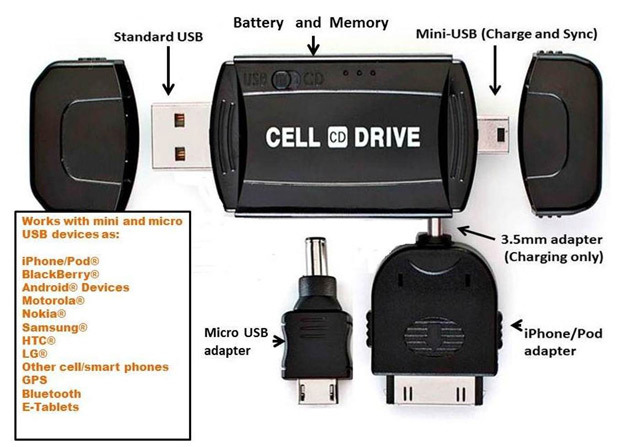 The Cell Drive comes with two charger adapters, a standard USB connector, a Mini USB connector and a convenient drawstring back for storage. It works with all Windows operating systems from 98 and up. It also is compatible with Mac 9x and higher. There is a one year warranty that comes along with the device that can be bought on Amazon or Cell Drive’s website. Instead of hauling around tons of cables and adapters, plus needing to actually locate outlets for charging, the Cell Drive does it all at the touch of a finger. That’s a whole lot of convenience and universal appeal for one tiny gadget. Thoughts? Does the Cell Drive USB offer enough features to meet your needs? This entry was posted in Android, Apple, Articles, BlackBerry, Cell CD Drive, Cell Drive, Flash Drive, iPad, iPhone, USB Battery, USB Cell Drive, USB Charger, USB Devices, USB Gadgets, USB Stick and tagged Cell CD Drive, Cell Drive, Cell flash drive, Cell Phone Charger, Mini USB adapters, Mini USB connector, Mobile Charger, one size USB gadget, USB adapters, USB Cell Drive, USB charger, USB connector, USB device, USB gadgets. Bookmark the permalink.